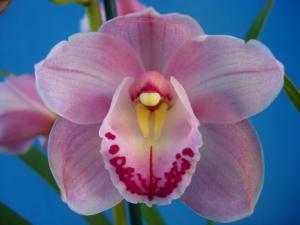 It is interesting to note that more plants die from over-watering than under-watering. People often make the mistake of watering plants every day and if moisture is retained in the drip tray the soil mixture can become saturated to the point of rotting the plant roots. Bear in mind that when the soil mixture is waterlogged there is little or no air in it and therefore nutrients cannot travel freely to the plant roots. There is a clever formulation that prevents this by having an oxygen releasing ingredient incorporated in it. The main point to remember when watering plants is to water them deeply and for a long period rather than lightly every day. Adding water crystals is a must for container gardening if you want your plants to stay healthy  it also has the added bonus of reducing the frequency of watering. For indoor plants that live in a controlled environment, a thorough soaking once or twice every week (depending on the time of the year) should be adequate for most plants. Outdoor plants dont have the luxury of climate control and are more often than not exposed to the harsh sun and wind which causes the potting mix to dry out quickly. As a general rule, any pots kept outside should be watered daily, except for hardy succulents and cacti  in the height of summer it might even be necessary to water some species twice daily. A lot depends on the type of plant  large foliage plants like hydrangeas would need more frequent watering. 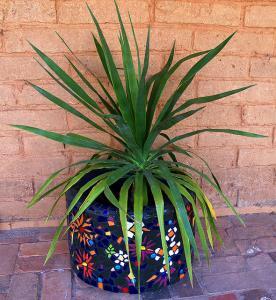 Plants in porous planters, like terra cotta pots need more watering than plants in glazed ceramic or plastic planters. Good quality potting mixes, especially the premium variety, often have water storing crystals already added to them so it would reduce the likelihood of the potting mix drying out. Let the plant dictate how much water is required  if the potting mix is still damp and the plant looks well, then skip watering till the mix is showing signs of drying up. 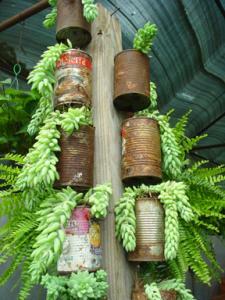 Self watering pots can take the worry out of watering. These work by storing water in a small area underneath the pot, with a tube that helps draw moisture into the potting mix. Drip trays are handy because they stop water marks from forming underneath flower pots. 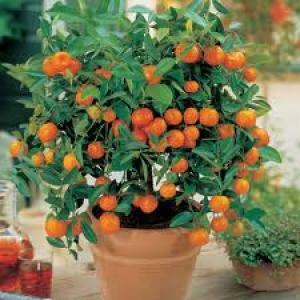 However, it must be noted that some plants eg citrus, perform better if not left to sit in a tray of water continually. A little water retained in the vase of the tray is okay but dont let it sit for days with the root mass waterlogged or it will result in root rot. 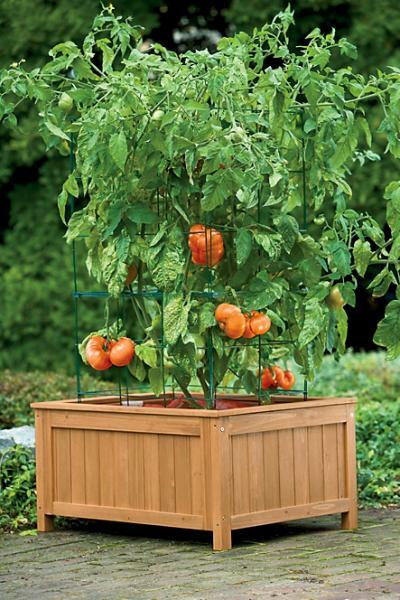 Consider investing in a watering system that links each flower pot with a slender black plastic hose and a small water outlet for drip watering. This can be connected to a tap with a timing device that automatically waters every evening at the same time. Pot plants inevitably suffer when you go on holidays. Theres an ingenious invention called the Green genius which acts with a wick system so that they plants continue to get their water supply whilst you are away. Mulch around the base of plants as you would a normal garden bed. This helps keep the soil in planters moist and prevents the surface from becoming hard packed which in turn makes it hard for moisture to penetrate at watering time. Suitable mulches include well rotted compost or manure, pine bark and pebbles. One of the most effective ways to feed plants is to mulch the top of the soil with organic matter that leaches nutrients to the plant roots each time the plant is watered. Manures are excellent mulches  just make sure that they are well rotted or they could burn the plant roots. Poultry manure is good for heavy feeders like vegetables whilst cow manure is best for other species. Homemade compost is probably the best additive for soil. If you dont have the time or space to make your own compost, then you can get bags of it from Floria Flora nursery. As with manure, make sure that it is well rotted before adding it  add at least 5cm over the soil surface.Bark is another good mulch although they dont provide much in terms of nutrients. 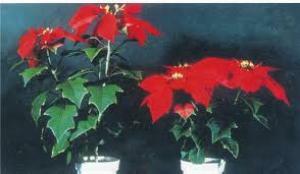 The best absorbed fertilizer is a liquid formulation that is applied after watering the plant. Liquid food is effective because it travels directly to the plant roots and is therefore quickly absorbed. They can also be mixed to any desired strength so you can dilute it and use it frequently to ensure that your plants get a slow and steady supply of nutrients. There are many types of liquid fertilizer on the market  there are synthetic ones and organic ones. Organic formulations include fish emulsion or seaweed extract and is excellent as plants thrive on it! 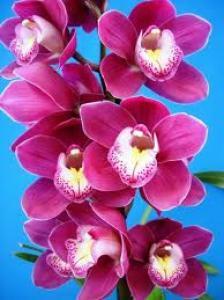 It also has the added benefit of making plants less susceptible to disease and insects. Theres even a fish/seaweed blend which captures the benefits of both formulations. Not all potting mixtures are created equal. In general, you get what you pay for. Many of the premium varieties would have water saving crystals and slow release fertilizers already pre-mixed in them so using them would definitely give your plants a head start in life. However, you can improve the quality of your regular potting mix by adding your own homemade compost or well rotted cow manure, peat and blood and bone and then throwing in some water saving crystals too. Gardens supply offers a nice organic blend container which offers pot plants a great start in life.